Observant Innovations has developed a number of software applications, built on the APERTURE Imaging Workbench, to provide a seamless user experience whilst operating our family of 360° cameras. These applications are built to run on industry standard PC platforms to enable sophisticated search and analysis through simple to use interfaces. We offer a suite of software applications to complement and match the unique nature of our 360° cameras. This is used to setup a PATROL camera. It is also used for live interactive control of the PATROL Camera, and can initiate recording and image streaming to remote locations. The Review application is used to browse and playback images previously recorded in to a PATROL image archive. 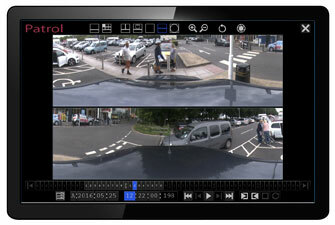 In the Observant software the graphical application can 'unwrap' and display a 360° panoramic image in real-time. In the Review Application a 2D panoramic image can be 'unwrapped', and then saved, into the PATROL image archive folder. The resolution of an 'unwrapped' image can be either pre-configured or set by a user. 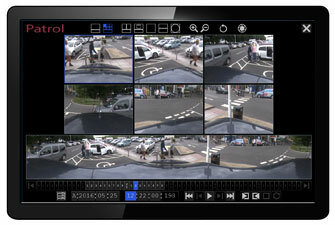 Click on the link below to download a complimentary PATROL Review Installer for use on Windows PC's. Once downloaded you have to extract the installer from the zip file, then double click on the installer to install the Patrol Review Application. Click on the link on the right to download a 6 second demo archive. You will need to extract the archive folder from the zip file before opening it in the Patrol Review Application. Please ﻿contact ﻿us to obtain other example Patrol image archives either via download (e.g. via WeTransfer) or by post.